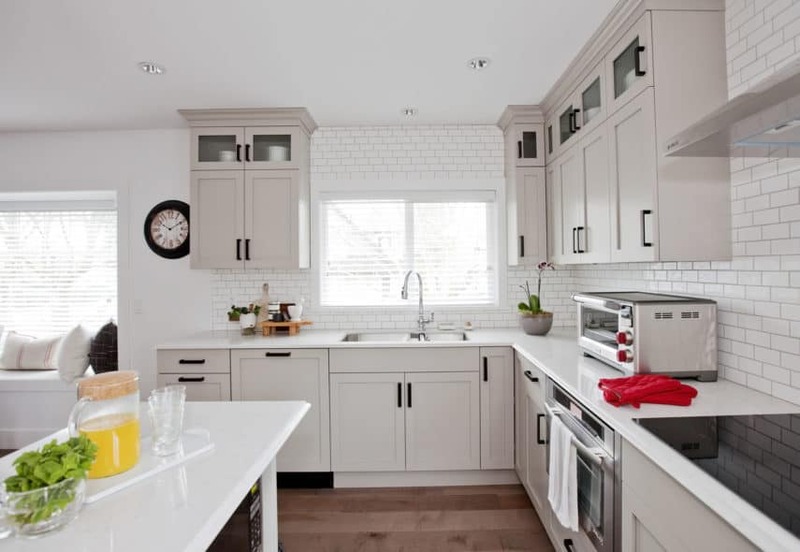 Rachelle & Tim | Love It or List It Galleries | Merit Kitchens Ltd.
Brightening up Rachelle and Tim’s home was challenging for Jillian and her team, until they selected pale, Haze gray cabinets for the kitchen to make the entire space brighter, fresher, and airier. The stacked wall cabinets – boasting the Manor Flat, Painted MDF door style – add height, and the glass-top doors offer an attractive place to display treasures. The paneled dishwasher provides a pleasing run of uninterrupted base cabinetry and dark, bronze hardware punctuates the kitchen design and adds drama.